He was flying his single engine aircraft for a leisurely flight when an unexpected stowaway revealed itself. As he was looking over his instrument panels to prepare for landing, he saw the head of a black snake poking out of the instrument panels. When he tried swiping at it, the snake darted to the other side of the airplane. You can read about the story here. Monty Coles was finally able to grab hold of the snake as he radioed in for emergency landing. After he safely landed the plane he was asked how he was able to land the plane safely and he replied that an instruction from his flight instructor saved his life. "No matter what happens...remember to fly the plane." There's a lot of changes in the landscape for all of us. But no matter what else is happening we've got to still fly the plane. What about you? Your church? Your organization? 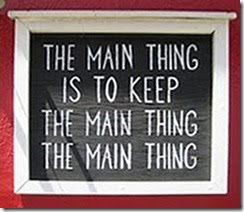 What is your main thing that you and your organization must be about no matter what else is happening around you? Saw this on FB. This one really made me laugh.